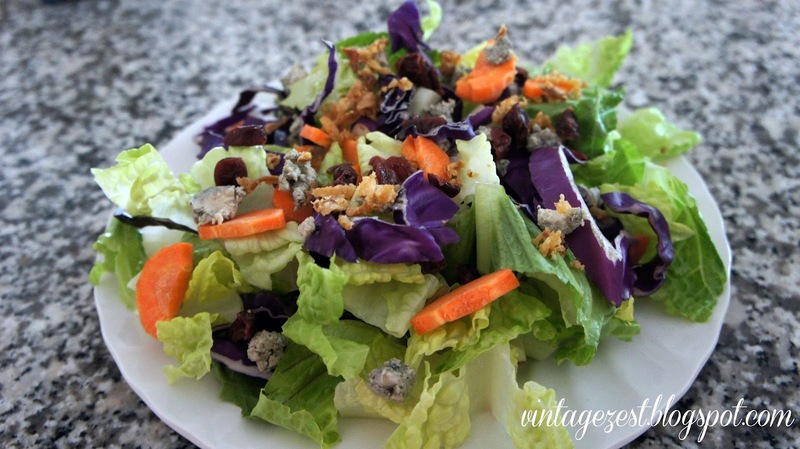 Favorite Salad "Recipe" ~ Diane's Vintage Zest! Well, at least I can eat right! I put together one of my favorite salads ever, which I eat every day, as long as I've been a good grocery shopper and food prep-er. Yes, I think I just made up a word. Hmmm... One of these things is not like the other! 1. Mix all ingredients together. Really, I have to explain why I love this salad so much. The ingredients comprise a range of tastes makes the salad interesting to eat, instead of just bland and boring lettuce greens. 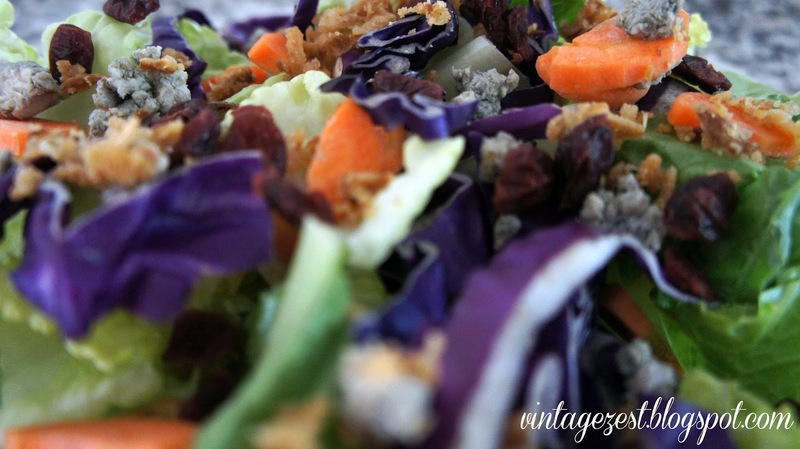 The saltiness of the blue cheese and french fried onions is contrasted with the sweet carrots and dried cranberries. The crunchiness of the french fried onions is also contrasted to the crisp lettuce and cabbage and the chewy cranberries. Each bite is a different experience! We LOVE salad here. I am always looking for new combinations! That salad sounds delicious! I have a favorite recipe, but it's not extremely healthy. It has a lot of bacon bits and croutons in it. And don't worry about not working out--tomorrow is a new day! I skipped my plan on Sunday, only worked out for half the time I said I would yesterday, but I pushed myself to do what I planned for today. You need to feel better first! Yummy! I love those fried onions! Your fruit drawer looks very similar to mine. :) Thanks for linking up at the Get Inspired Weekend Blog Party! Everything with fried onions it's A Good Thing!!!! I'm pinning it to my Easy to be Green board! Coming to visit you via the Taylor House Pinterest party! This looks yummy! Thanks so much for sharing at Krafty Inspiration Thursday! Maria @ Krafty Cards etc. Thursday. Hope you are having a great weekend and come back soon! I'm Diane, a girl who loves all things vintage, including sewing, baking, organizing, handmade stationery, and pretty cake stands. This site is a collection of all of my favorite things, and hopefully some of yours too! Kitchen Basics: How to Pick & Prep Produce - Tropical Fruit Edition! Veggie Güveç: Turkish Eggplant Stew - Easy Cooking! Find a sponsor for your web site! Get paid for your great content at Shareasale.com! Visit Diane's profile on Pinterest. Copyright © Diane's Vintage Zest!